tracted from 200 μl of plasma by a simple liquid-liquid extraction using diethyl ether – n-hexane (80:20, v/v). 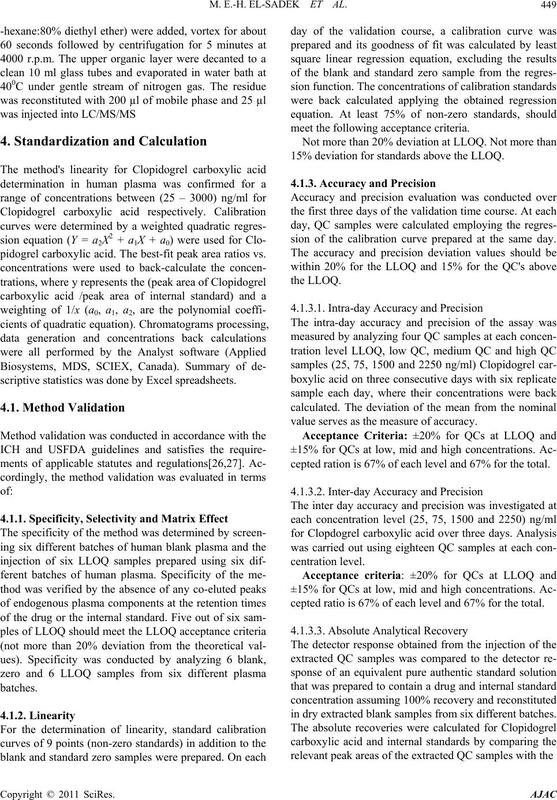 fication (LLOQ) was 25 ng/ml showing good linearity over the working range of 25 – 3000 ng/ml (r ≥ 0.999). toring of Clopidogrel in Clopidogrel-treated patients. profile and dosing requirements [1-3]. sis of methyl ester group [6,7]. 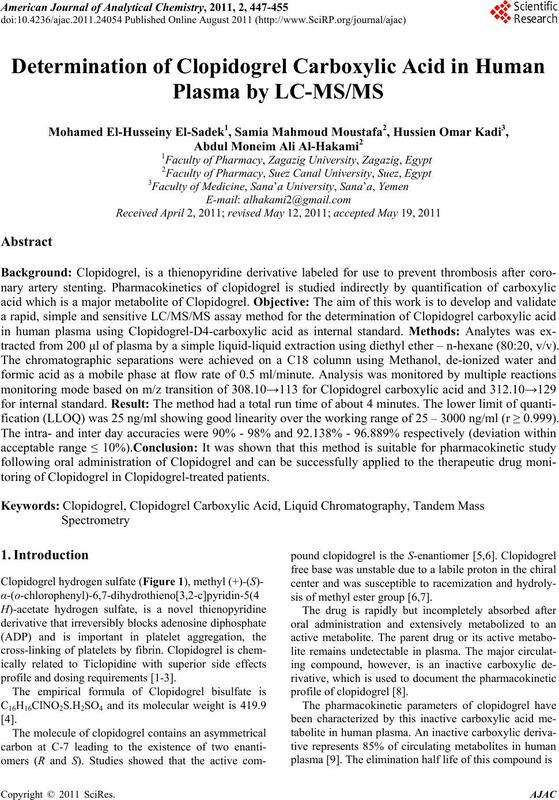 M. E.-H. EL-SADEK ET AL. Figure 1. Chemical structure of clopidogrel bisulfate. lasts the lifespan of the platelet (7-10 days) [12-14]. VWR, EC. De-ionized water was purchased from Milli. ml/ min. the column oven temperature was 30˚C. 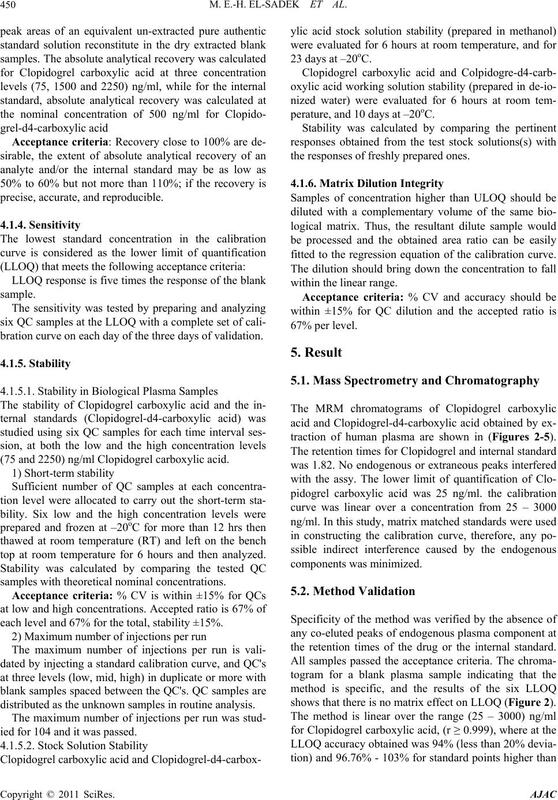 and Q3 in multiple reaction monitoring (MRM) mode. total run time 4 minutes. pidogrel carboxylic acid. The best-fit peak area ratios vs.
scriptive statistics was done by Excel spreadsheets. meet the following acceptance criteria. 15% deviation for standards above the LLOQ. sion of the calibration curve prepared at the same day. value serves as the measure of accuracy. cepted ration is 67% of each level and 67% for the total. cepted ratio is 67% of each level and 67% for the total. in dry extracted blank samples from six different batches. bration curve on each day of the three days of validation. 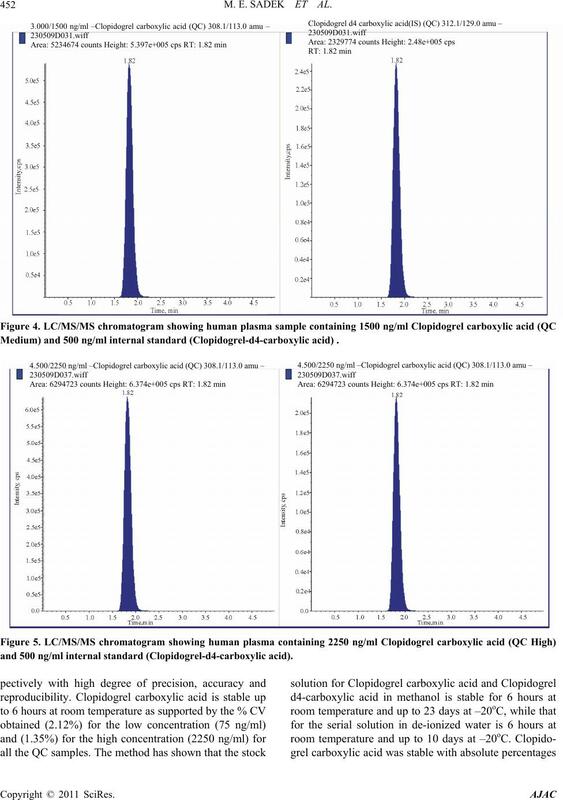 (75 and 2250) ng/ml Clopidogrel carboxylic acid. top at room temperature for 6 hours and then analyzed. samples with theoretical nominal concentrations. each level and 67% for the total, stability ±15%. distributed as the unknown samples in routine analysis. ied for 104 and it was passed. perature, and 10 days at –20oC. the responses of freshly prepared ones. fitted to the regression equation of the calibration curve. traction of human plasma are shown in (Figures 2-5). the retention times of the drug or the internal standard. shows that there is no matrix effect on LLOQ (Figure 2). 500 ng/ml internal standard (Clopidogrel-d4-carboxylic acid). 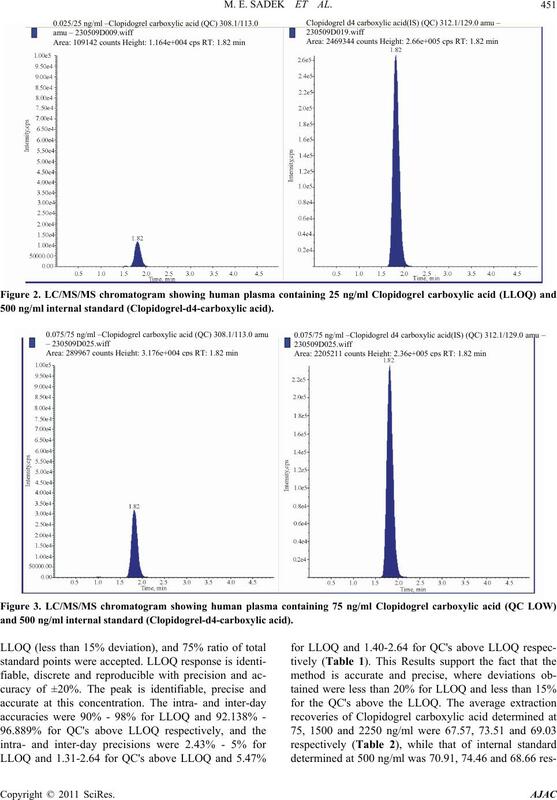 and 500 ng/ml internal standard (Clopidogrel-d4-carboxylic acid). M. E. SADEK ET AL. Medium) and 500 ng/ml internal standard (Clopidogrel-d4-carboxylic acid) . three days with six replicates per day. Table 2. 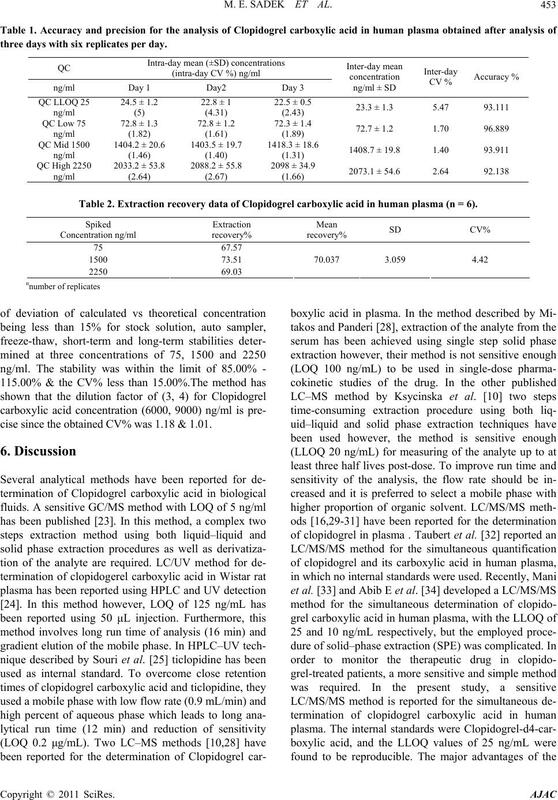 Extraction recovery data of Clopidogrel carboxylic acid in human plasma (n = 6). cise since the obtained CV% was 1.18 & 1.01. 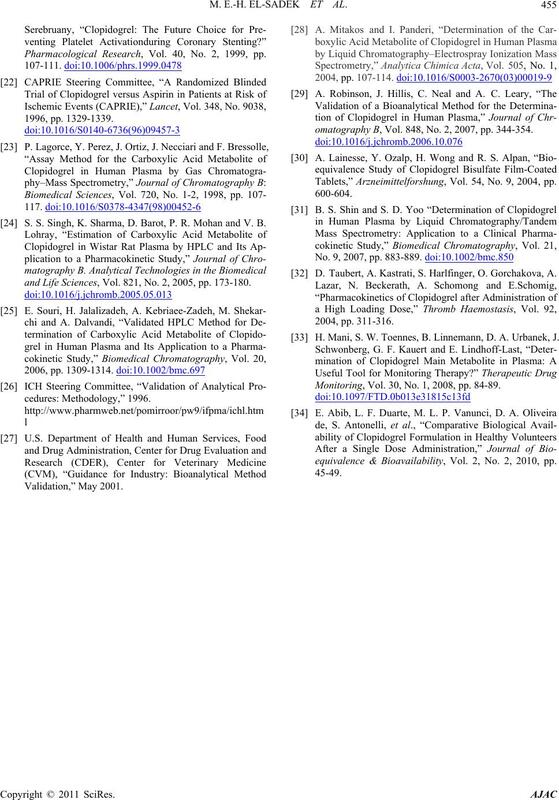 D. C. Mills, R. Puri, C. J. Hu, C. Minniti, G. Grana, M. D.
New York, 2006, p. 1483. P. Savi, J. Combalbert, C. Gaich, M. C. Rouchon, J. P.
Haemostasis, Vol. 72, 1994, pp. 313-317.
and Disposition, Vol. 30, No. 11, 2002, pp. 1288-1295.
vascular Drugs, Vol. 11, No. 2, 1993, pp. 180-198. T. R. Rao, P. R. Usha, M. U. Naidu, J. A. Gogtay and M.
Anaesthesia, Vol. 58, No. 1, 2008, pp. 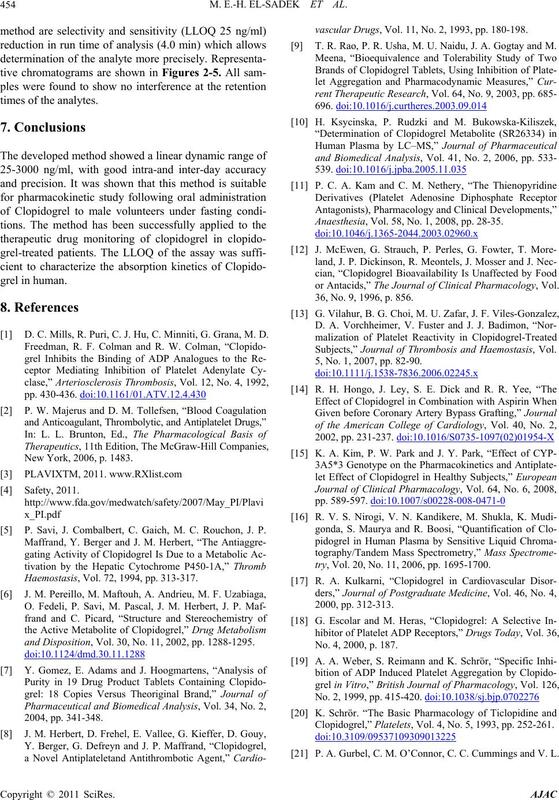 28-35.
or Antacids,” The Journal of Clinical Pharmacology, Vol. 36, No. 9, 1996, p. 856. Subjects,” Journal of Thrombosis and Haemostasis, Vol. 5, No. 1, 2007, pp. 82-90.
try, Vol. 20, No. 11, 2006, pp. 1695-1700. No. 4, 2000, p. 187. 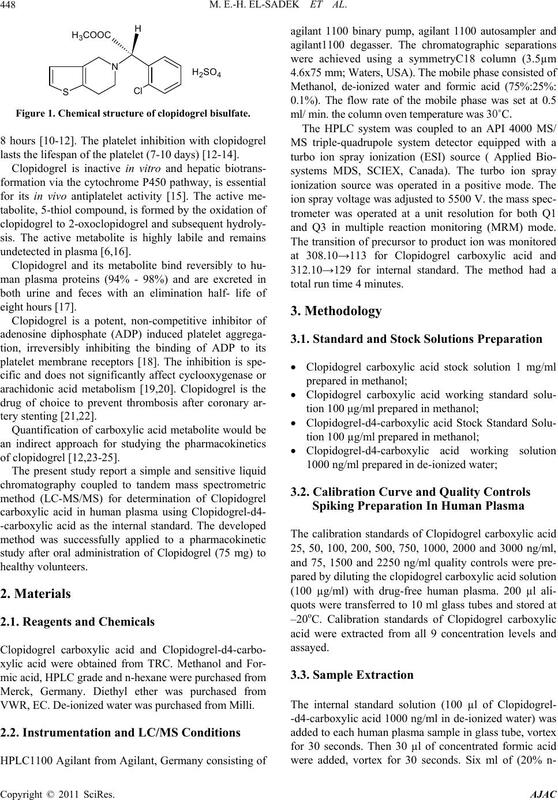 Clopidogrel,” Platelets, Vol. 4, No. 5, 1993, pp. 252-261. P. A. Gurbel, C. M. O’Connor, C. C. Cummings and V. L.
Pharmacological Research, Vol. 40, No. 2, 1999, pp. S. S. Singh, K. Sharma, D. Barot, P. R. Mohan and V. B.
and Life Sciences, Vol. 821, No. 2, 2005, pp. 173-180.
omatography B, Vol. 848, No. 2, 2007, pp. 344-354. Tablets,” Arzneimittelforshung, Vol. 54, No. 9, 2004, pp. D. Taubert, A. Kastrati, S. Harlfinger, O. Gorchakova, A.
 H. Mani, S. W. Toennes, B. Linnemann, D. A. Urbanek, J. Monitoring, Vol. 30, No. 1, 2008, pp. 84-89.
equivalence & Bioavailability, Vol. 2, No. 2, 2010, pp.